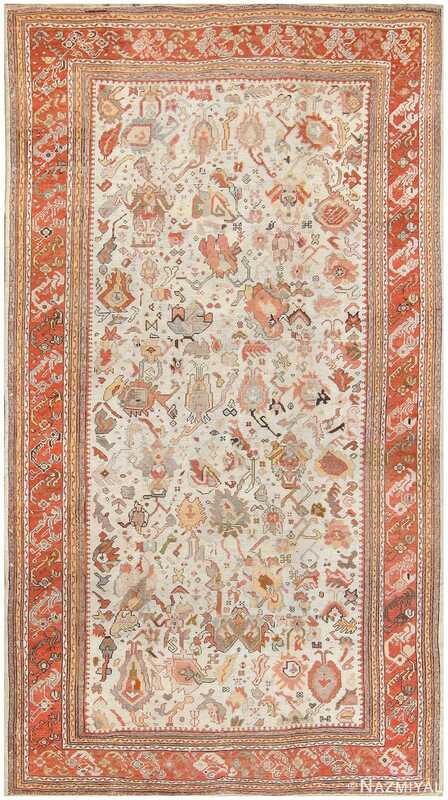 Antique Oushak Rug, Country of Origin: Turkey, Circa Date: Turn of the 20th Century – This luxurious antique Turkish Oushak rug epitomizes the provincial style of Oushak weaving, which is beloved among collectors and decorators alike. 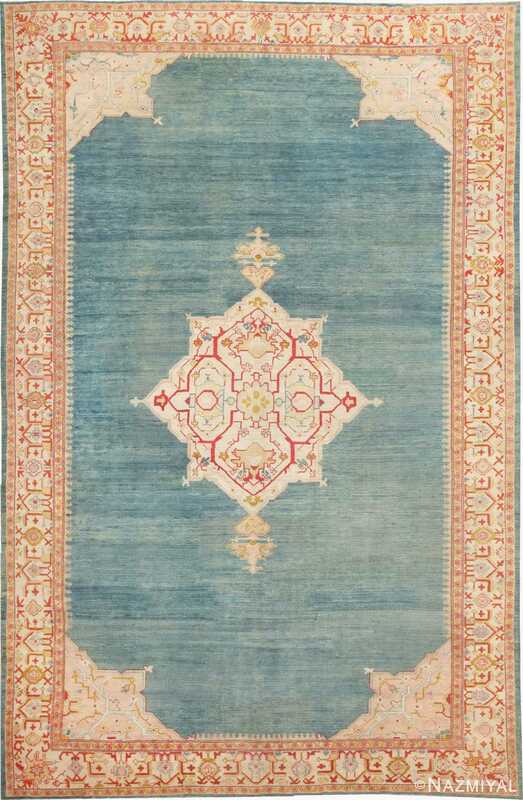 The carpet’s superb cerulean field is adorned with a minimalist medallion-and-corner design that highlights the open space of the ground and its rich variegated abrash. Strongly outlined palmettes and delicate botanical decorations adorn the central medallion while complementing the regal ivory and coral red accents that appear in the ornamental main borders. Classical reciprocating floral guard bands flank the regal primary borders, which feature decorative symbols and compound motifs that form angular turtle-like units. Protective crenelated fence accents line the edges of the beautifully colored field while striking a comfortable balance between ancient symbolism and the restrained, sophisticated designs that appeal to western consumers and decorators then and now. It is a breathtaking piece in excellent condition (so it could take daily traffic and use with no problem). A beautiful reflecting pool graces the field of this formal antique Turkish rug from Turkey which was woven around the turn of the 20th century. 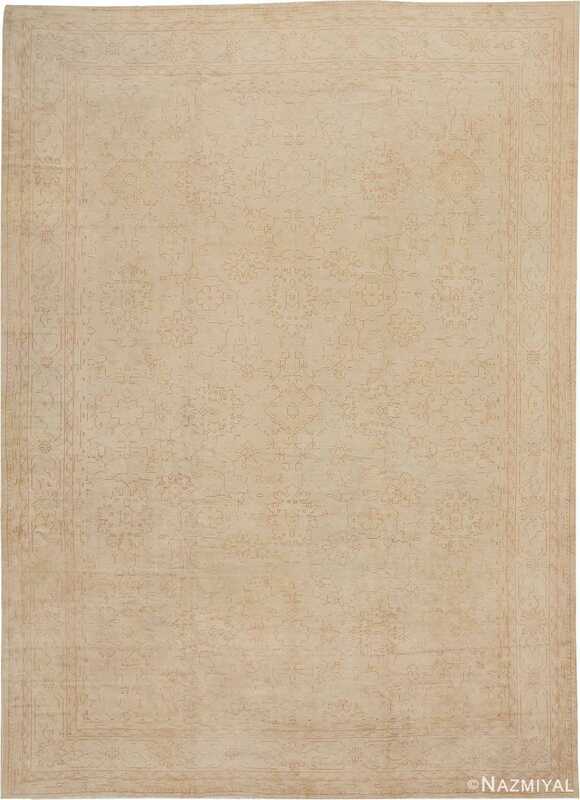 This magnificent antique rug stems from a time that was embodied by grand palaces and public spaces. Many times, visitors would be greeted by formal reflecting pools surrounded by intricate geometric tile work. These formal pools were meant to connect the person to the sublime. 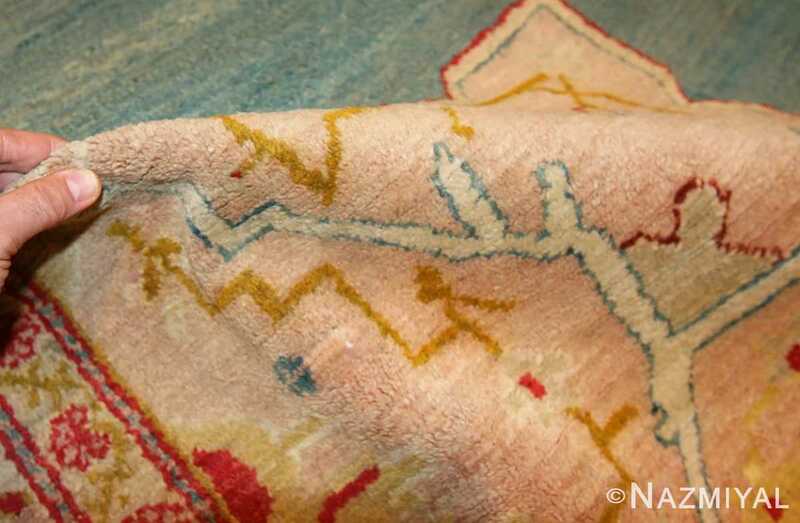 This antique Turkish Oushak rug captures the essence of one of these formal and brings it inside. This beautiful large size rug is based on an open field central medallion design with formal corners and a formal main border. 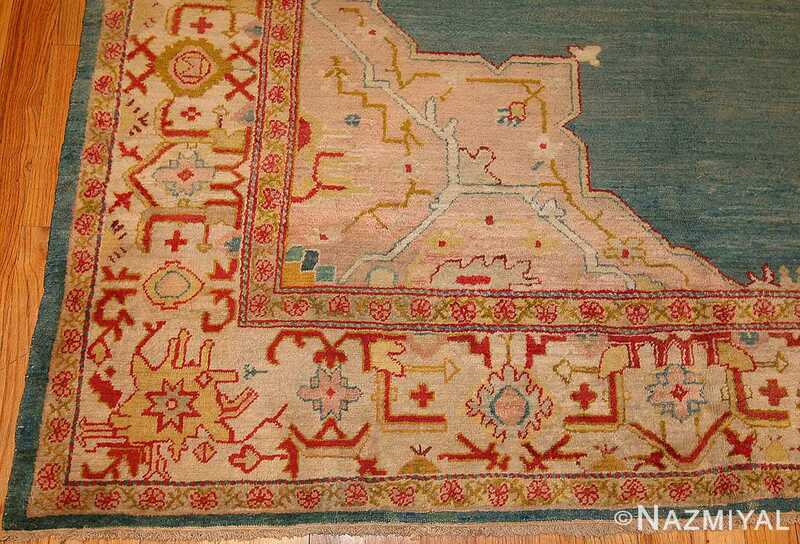 This tribal antique carpet utilizes geometric shapes in a similar manner as can be found throughout miniature paintings and the architecture of the period. 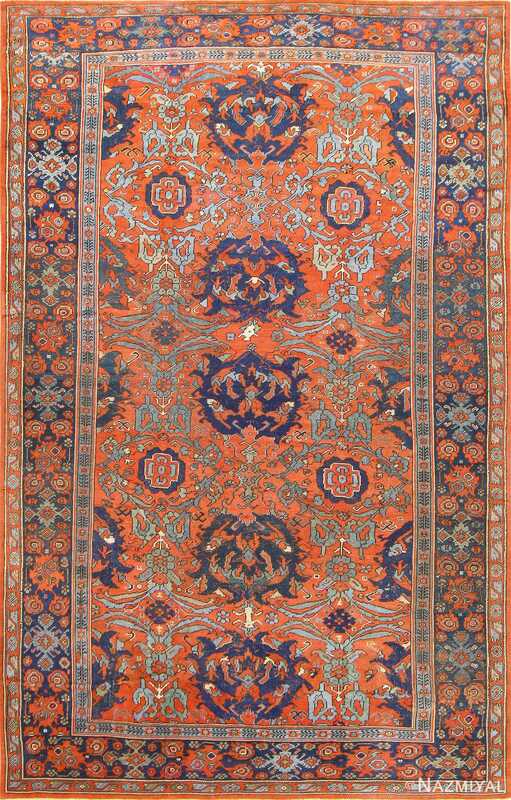 The use of colors is quite simple, which serves to emphasize the geometric design shapes and draw the eye to the center of the Oushak carpet. 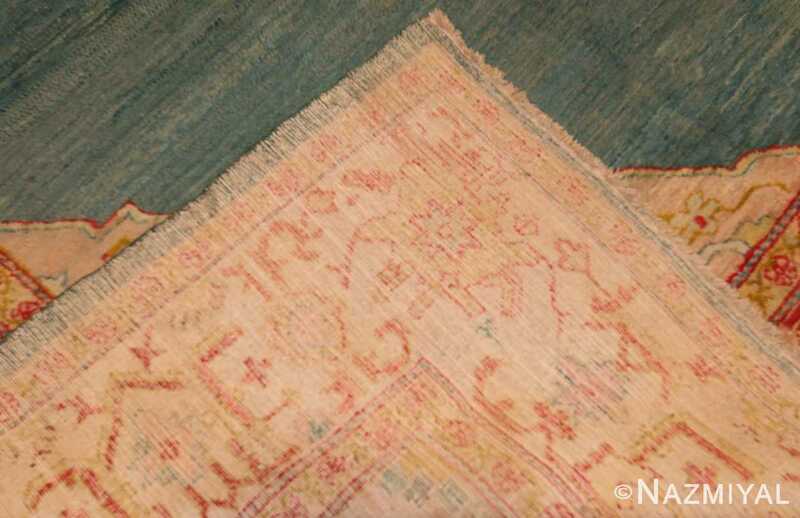 One of the more fascinating features of the antique Turkish rug is the use of abrash rug color shading throughout the blue field. It is done in such a way as to make the field of the large light blue / sea foam green colored Oushak rug appear to be gently rippling water. It mimics the way light dances off of a calm reflecting pool on a sunny day. It invites one to sit along the side and let their thoughts drift away. 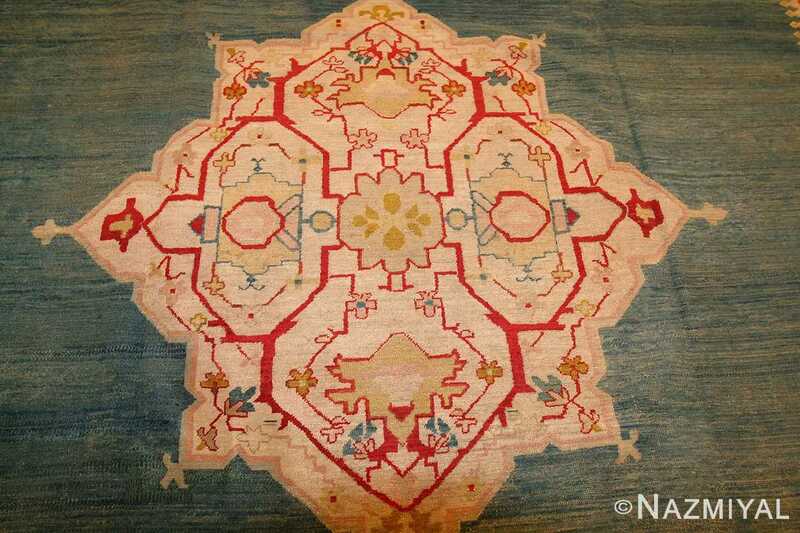 This is a unique rug design pattern and allows you to bring an element of the outdoors to an indoor space. It would make a beautiful addition to a room that reflects a garden-like setting. The geometric shapes within this beautiful Oushak rug add a sense of formality in the water adds serenity and calm to the space. 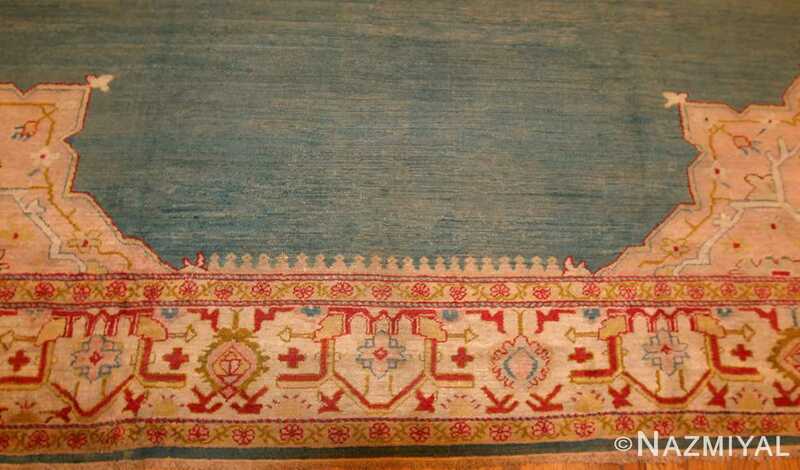 This antique Turkish Oushak rug creates the perfect place for reflection.